Clibbon was far removed from the romanticized fictional highwayman, impeccably mounted, well mannered and keen to preserve both a gentleman's reputation and a lady's modesty. A resident of Wareside, by trade he was a pieman, a well-known sight hawking his wares around Hertfordshire markets. Mingling with traders he could ascertain who had concluded lucrative business and would therefore be returning home flushed with money. Some versions state that he feigned blindness, thereby enabling him to keep in close contact with traders without raising suspicion. Once a likely victim had been earmarked, he would, along with his two sons and occasionally his wife, suitably clad in men's attire, affect an ambush, and, under threat of death, relieve them of their money. On Saturday, December 28th 1782 he paid his customary visit to Hertford market noting that a man named Robert Whittenbury received in excess of £ 200 for his dealings. What happened next is the subject of dispute. A 1970 version of the tale relates that Clibbon waylaid the wrong Mr. Whittenbury, attacking instead his son William who had gone on ahead. He escaped and, realizing the danger to his father, made his way to Queen Hoo Hall for assistance. With this help he intercepted his father as he made his way home. The party proceeded together until the inevitable attack took place. During the ensuing fight, Benjamin, William's uncle, was knocked to the ground. Clibbon stood over him and started to make ready his clasp knife. Fearing for his life, Benjamin shouted to his servant, North known by his nickname as Shock, "Shoot, Shock, or I'm a dead man." Shock did shoot, killing Clibbon instantly. One of his sons escaped, the other was taken and executed. The body was carried to the Horns Public House at Bull Greens, people flocking from miles to see who had been carrying out the frequent robberies. During the viewing, ropes were attached to the body and it was dragged amidst great cheering on a plough sledge to the point of the attack. Here it was buried with a stake driven through it. A slight variation to the story has Whittenbury senior as the only person involved. It states that he had noted Clibbon's glances during the market and suspected an attack. He despatched a servant home early with the money telling him to return to the expected point of the robbery and lay silently in the hedge. Whittenbury alone then made his way home expecting to be able to see off the attacker, believing of course it to be Clibbon. Unfortunately he underestimated his power and during the attack feared for his life. Again he called out to Shock, who, obeying his master despatched Clibbon from this life. The grave is still marked with a tall wooden pole said to symbolize that driven through the body. 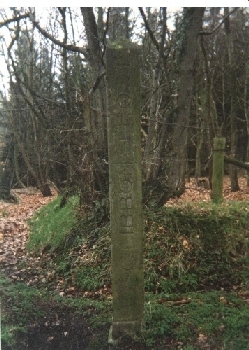 Although replaced several times since the original event, it can still be found on the right hand side of the road (when travelling towards Hertford) of the Bull Green Road between Bramfield and Datchworth, about a mile from the former.